Achieve a smooth and uniform complexion with the SkinMedica LYTERA 2.0 Pigment Correcting Serum and Retinol Complex 0.5; a potent duo that target signs of aging, as well as dark spots and hyperpigmentation. When used in synergy, skin tone appears more even and the visage is youthful. Get even with the LYTERA 2.0 Pigment Correcting Serum; a pioneering discoloration treatment expertly formulated to address the most stubborn dark spots and hyperpigmentation. Suitable for all skin types and tones, the advanced serum combines Tranexamic Acid and Phenylethyl Resorcinol to help correct and balance melanin production for a more even tone. Niacinamide and Tetrapeptide-30 work in tandem to combat the development of new spots, while a Marine Extract Blend supports a healthy barrier function for enhanced protection from sun damage. Delivering improvements in texture and tone within as little as two weeks and dramatic progress after continued monthly use, the serum helps you to achieve a refined and more unified complexion. Non-comedogenic. Free from retinol, hydroquinone, parabens and fragrance. 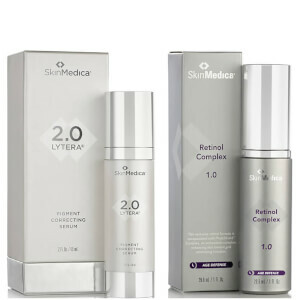 SkinMedica’s Retinol Complex 0.5 works gently yet effectively to visibly improve skin's texture. Boasting an ultra-gentle, yet effective form of stabilised retinol, the formula increases cell turnover to reduce the appearance of fine lines, wrinkles and hyperpigmentation. The treatment is enriched with three forms of Vitamin A, in a microparticle delivery system, which enhance skin’s texture through exfoliation and skin regeneration. Retinol Complex: Apply a single pump to face in the evening. If you have never used a retinol product before, begin by limiting use to twice a week, gradually increasing frequency to every other night, and then advancing to each evening or as tolerated. Mild redness, peeling and irritation is expected when using this product. Use daily sun protection with SPF 20 or higher during use of this product. Avoid getting in eyes. If contact occurs, rinse eyes thoroughly with water. Serum: Water, Butylene Glycol, Glycerin, Niacinamide, Polyacrylate-13, Phenylethyl Resorcinol, Tranexamic Acid, Vitis Vinifera (Grape) Flower Cell Extract, Plankton Extract, Tetrapeptide-30, Artemisia Capillaris Flower Extract, Vibrio Alginolyticus Ferment Filtrate, Alteromonas Ferment Extract, Tocopheryl Acetate, Polyisobutene, Polysorbate 20, Caprylic/Capric Triglyceride, Hydroxyacetophenone, Phytic Acid, Diethylhexyl Syringylidenemalonate, Disodium EDTA, Ethylhexylglycerin, Phenoxyethanol. Retinol Complex: Water/Aqua/Eau, Cetyl Ethylhexanoate, Glycine Soja Oil, Niacinamide, Polyacrylate-13, Caprylic/Capric Triglyceride, Squalane, Retinol, Palmitoyl Tripeptide-8, Dunaliella Salina Extract, Magnolia Grandiflora Bark Extract, Tocopherol, Tocotrienols, Ceramide 3, Bisabolol, Phytosterols, Squalene, Tocopheryl Acetate, Oryza Sativa Bran Cera, Glycerin, Polysorbate 20, Butylene Glycol, Cetyl Palmitate, Laureth-23, Trideceth-6 Phosphate, Sodium Hydroxide, Dicaprylyl Ether, Lauryl Alcohol, Polyisobutene, Dextran, Potassium Sorbate, Disodium EDTA, Phenoxyethanol, Ethylhexylglycerin. Serum: 60ml / Retinol: 29.6ml.